Affordability: In a time when it is becoming increasingly difficult to justify equipping an entire technical staff with high-end equipment, companies are even more cost-conscious than before. Outfit a majority of the installation/repair trucks with OWLTrek OTDRs, and set aside a few high-end “expert” vehicles for high-priority roll-outs. Usability: The OWLTrek OTDR may be pocket-sized, but the large 2.8” high-resolution color LCD display can show even the longest traces with ease. And, for greater viewing flexibility and trace detail, OWL has implemented state-of-the-art MEMS technology which “flips” the high-resolution color LCD display between portrait and landscape mode automatically. In landscape mode, a wider viewing area means greater viewing detail. Automatic Event Locations: Automatic event location is an advanced feature normally found only in expensive, high-end OTDRs. The OWLTrek OTDR now brings this feature to the entry-level OTDR market. While in event location mode, the OWLTrek OTDR marks events on the trace, has an event table showing the location, type, reflectance level, and loss of each event, and auto-zooms to the selected event. 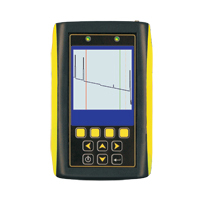 With an unbeatable combination of a small pocket-sized form factor, a large high-resolution 2.8” color LCD display, and some of the lowest pricing in the industry, the OWLTrek OTDR from OWL is the WISE choice for cost-conscious buyers who only need to perform basic troubleshooting or restoration tasks on multimode optical fiber networks. All this from an OTDR that really is pocket-sized and fair priced, yet having comparable features and specifications to other OTDRs in its class. Affordability: In a time when it is becoming increasingly difficult to justify equipping an entire technical staff with high-end equipment, companies are even more cost-conscious than before. Outfit a majority of personnel with OWLTrek multimode OTDRs, and set aside a few high-end “expert” devices for high-priority installs. Automatic Event Location: Automatic event location is an advanced feature normally found only in expensive, high-end OTDRs. The OWLTrek OTDR now brings this feature to the entry-level OTDR market. While in event location mode, the OWLTrek OTDR marks events on the trace, has an event table showing the location, type, reflectance level, and loss of each event, and auto-zooms to the selected event. Dynamic Range vs. Distance: OWLTrek multimode OTDRs are capable of finding breaks in multimode optical fibers up to 12 miles to within +/- 6 feet. Additional splices and other loss producing events will limit end distance estimates. This is true for all OTDRs. However, passive multimode links are rarely longer than 1.25 miles long! At that short distance, OWLTrek has break-finding capability of about +/- 1 meter! In fact, increased dynamic range is actually a disadvantage in almost all cases because of the increased OTDR cost (usually thousands of dollars more). 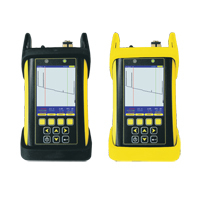 With an unbeatable combination of a small pocket-sized form factor, a large high-resolution 2.8” color LCD display, and some of the lowest pricing in the industry, OWLTrek Quad Kit OTDRs are the WISE choice for cost-conscious buyers who need to perform basic troubleshooting or restoration tasks on multimode and singlemode optical fiber networks. All this from OTDRs that really are pocket-sized and fair priced, yet have comparable features and specifications to other OTDRs in their class. Affordability: In a time when it is becoming increasingly difficult to justify equipping an entire technical staff with high-end equipment, companies are even more cost-conscious than before. Outfit a majority of installation/repair personnel with OWLTrek OTDRs, and set aside a few high-end “expert” devices for high-priority jobs. Usability: OWLTrek OTDRs may be pocket-sized, but their 2.8” high-resolution color LCD display can show even the longest traces with ease. And, f Usability. or greater viewing flexibility and trace detail, OWL has implemented state-of-the-art MEMS technology which “flips” the high-resolution color LCD display between portrait and landscape mode automatically. In landscape mode, a wider viewing area means greater viewing detail. Automatic event location: Automatic event location is an advanced feature normally found only in expensive, high-end OTDRs. With OWLTrek OTDRs, OWL now brings this feature to the entry-level OTDR market. While in event location mode, the OWLTrek OTDR marks events on the trace, and has an event table showing the location, type, reflectance level, and loss of each event, and auto-zooms to the selected event. Two units are better than one: Most OTDR manufacturers tend to implement an inflexible approach by over-integrating four wavelengths into a single OTDR unit. OWL takes an innovative approach that very few OTDR manufacturers even consider – by including separate dual-wavelength multimode and singlemode OTDRs. There are two key disadvantages to using an over-integrated quad-wave OTDR. First, most installer firms need to have at least two crews working simultaneously to be profitable. Second, most fiber optic jobs rarely include both multimode and singlemode fibers. So, if one crew is installing multimode and another crew is installing singlemode, it makes sense to have separate multimode and singlemode OTDRs so one crew does not have to wait on the other to finish their job. And even with two separate units, the OWLTrek Quad Kit OTDR is still more cost-effective than other manufacturers’ quad-wavelength OTDR options. Dynamic Range Vs. Distance: OWLTrek OTDRs are capable of finding breaks in singlemode and multimode optical fibers within +/- 6 feet, out to a maximum distance of 80 miles in singlemode and 12 miles in multimode. Additional splices and other loss producing events will limit end distance estimates, which is true for all OTDRs. However, when you stop to consider that most passive singlemode Telco links are almost always less than 12 miles long, and multimode links are less than 1.25 miles long, spending thousands of dollars more for a little bit of extra dynamic range that you will probably never use is frivolous and unwise.